So many of my friends from back east have been sending me pictures of the snow and lamenting about the chilly weather that they're experiencing. On the other hand, I've been lamenting to them about wearing spring dresses, open toe shoes and no coats in the middle of January here in sunny California. Not that I don't appreciate it, but psychologically as soon as the fall season hits, my mind immediately goes into hibernation; looking forward to those occasional snowed in days to fully enjoy the warmth of a cozy home, wrapped in a faux fur throw, drinking something hot and watching favorite TV shows without feeling guilty. But being in a climate with no real winter or seasons, somehow messes with my mind and seems to never really give my body any down time to rejuvenate...not to mention, I miss wearing my winter wardrobe. 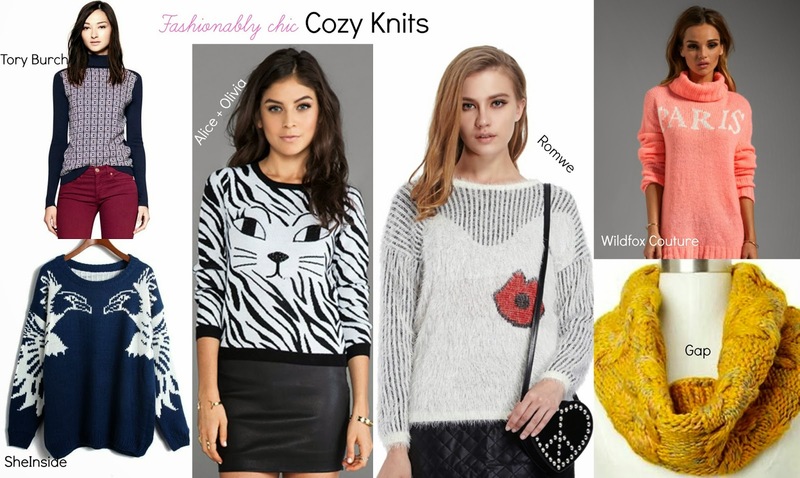 Being in a NY state of mind and in honor of sending warm wishes to my chilly friends back home, I thought I'd share some of my favorite fashionably chic cozy sweaters that are sure to put a smile on the face and dispel any winter blues. They're fun, and whimsically snug.